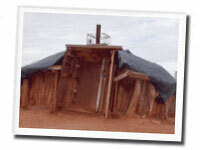 The Council of Indian Nations program delivers a broad range of services to poor and isolated Native American communities on Southwest reservations. The CIN program has developed a unique approach in helping to ease the hardship these communities experience, and places special emphasis on helping Native American Elders live in dignity and comfort. Winter Fuel: Ensuring Elders stay warm in the winter through distribution of fuel vouchers. Food: Delivers nutritious food to partners who prepare food on a regular basis at elder nutrition centers. Health: Providing incentive items to encourage attendance at diabetes screenings, nutrition and cooking classes, or exercise classes. Weatherization and Home Safety: Helping make homes more weatherproof and safe for Elderly residents along with emergency kits that provide needed supplies in inclement winter. Hug-a-Bear: Working with medical and rescue teams to get stuffed animals into the hands of children in crises. Thanksgiving: Serving thousands of Thanksgiving meals. Christmas: Providing holiday meals and gift packages for Elders and their families.